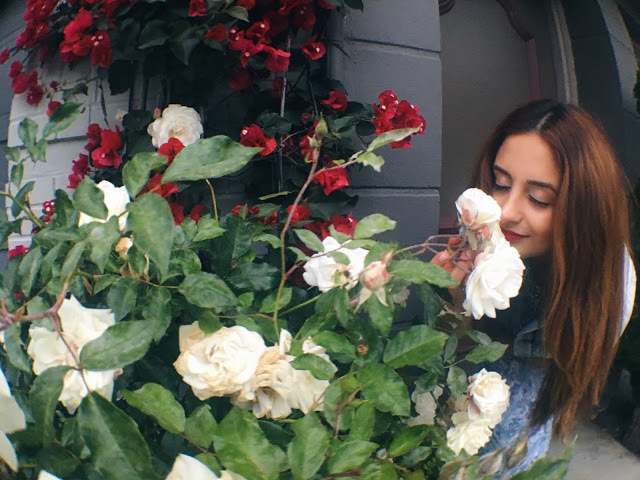 We've all heard the expression "stop and smell the roses," but how many of us actually do it? My grandfather did. When he was alive, my grandpa was very active. He had a routine and everyday he would go for a walk or he would go to the galleria and he would be home by around 6pm for dinner. Sometimes he would take the bus and go to the beach. But grandpa was never in a hurry and he was always at peace, despite any of his health problems or any other issues he may have had. And during this time of the year, when the roses would bloom in front of our house, grandpa would always take a second to smell the roses before he left for his walk. He would literally do it, but I would argue that in doing so, he metaphorically "stopped and smelled the roses" too in different parts of life. I took this photo about a year ago with my friend O'Bryan - Thanks, O.B.! I noticed it recently on my desktop and was reminded of my grandpa, and how important and healthy it is to pause and take a breather in life. Here's what I'm doing to "stop and smell the roses:"
I didn't realize how important keeping the Sabbath was until now. I used to think of it as just another commandment or 'word of wisdom' type of thing from the Bible. But I'm beginning to realize, as I work full time and support myself, that it's actually a blessing and it's healthy to take a break once a week. "By the seventh day God finished the work he had been doing, so he rested from all his work. God blessed the seventh day and made it a holy day, because on that day he rested from all the work he had done in creating the world." I work in sales, so that means I'm constantly talking to people. I also live in SF and in a part of the city that can get a bit loud at times. So being alone in nature is a great way for me to take a break. I sometimes go to the Yerba Buena Gardens by myself during my lunch break to and lay down, listen to music, and zone out from the world around me for 30 minutes to an hour. Walking is great because it helps me slow down (which is contrary to how I usually am- in a hurry!). Walking now only allows me to take things slowly, but helps me to enjoy the world around me and discover new places in the city. For me, stopping and smelling the roses doesn't necessarily have to mean stopping in the literal sense. But it means taking a break from the busyness of my day to day routine, and doing something out of the ordinary. It means taking a break and realizing and appreciating the big picture that is life. What do you do to pause and unwind? I'd love to hear from you in the comments below. It can mean something different to you and be manifested differently in your life than it is in mine. Whatever it is, and if you already aren't, I encourage you to pause and take a break from life's craziness. It will make you more productive throughout the week and at peace with yourself and the environment that you're in. Promise. It can be hard for me to not do anything at all! I'm always doing two or three things at once instead of doing one thing 100%. Even when I walk around the city I tend to listen to podcasts or energizing music, but lately I've been putting my headphones in my bag and just listening to what's around me, snippets of conversation, the wind in the trees, whatever, and I find it really calming. Thanks so much for stopping by and reading my post. I agree, it can be really hard to just be still when we're so used to listening to music or constantly being entertained by something (like our phones, social media, or even our friends). I find it really relaxing and peaceful to put my phone away during walks and just people watch or reflect! :) I also find that the best ideas and moments of inspiration come during those times!